In a previous post I talked about how we could modify a software’s behavior by using object composition (as opposed to class inheritance). A clear example is the state pattern. Let’s take a look. So, what’s wrong with this code? Well, the problem is that for every operation we add, we must check if the car is on or off. If you keep on adding states like no gas, you will end with a lot of flags and conditional logic based on that. And, mark my words, it’ll become a bug’s lair and a complicate piece to maintain. Whenever you find code like this, congratulations, you have found yourself a state machine. 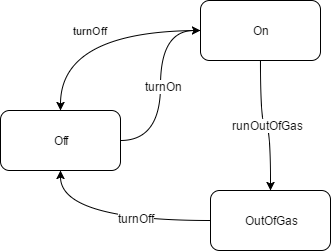 A state machine is a way of reasoning that simplifies reasoning about a program by identifying the possible states the software can take at any given moment and the transitions between them. In our example a car can be in an off or on state. If you try to accelerate and the car is off, nothing will happen, however if it’s on, it will increase its speed. To refactor the code to a state machine you need to identify the states, extract the associated behavior to a state on an object and invoke the logic on the state object methods. Now we must create objects that represent the behavior for each state of the application. Since the operations for each state are the same, we can create an interface. Now the Car object is simple to maintain and understand. Whenever you find yourself looking to a lot of conditions based on booleans, pay attention, you are probably looking to a state machine type of problem. If you have more than 2 states, I strongly suggest that you consider refactoring to the state pattern. And model your object behavior as a state machine, just like we outlined before. Keep in mind that this example is for illustration purposes only. In real life, this is likely to be way more complicated. Remember that there is a price to pay for using any design pattern. In this case the flexibility and simplification required the creation of more objects. Always weigh the pros and cons before coding anything! Next Post → Free microsoft ebooks!